With the temperature at -26 degrees (and a windchill even lower) my district had "cold" weather days for the past two days. Our instructional support team (which I am now part of as an instructional coach) braved the cold to attend the annual Michigan Assessment Conference. The conference covered the changing face of state assessments, common assessments, formative assessments and growth models. A new teacher in one of the sessions I attended told me that she was shocked to learn that assessment can be useful to teachers. I was shocked by that statement, at first. Then came the realization that in general the majority of our new teachers are coming out of teacher prep programs with a negative feeling about assessment. Since I doubt our state governments or the federal government are going to ease up on testing anytime soon, I choose to accept whatever useful information the results give me to improve instruction and ignore the negativity. It would be sad to me if the negative press around testing prevented our teachers from opening their minds to using formative assessments in their classrooms. The information we gather about student learning from formative assessments can and should be used to guide our instruction. As teachers we need to do everything we can to work smarter. Working smarter maximizes student progress and that progress is faster when we've developed clear learning targets based on assessment. As a teacher, I often thought about why the nuns always gave me a pre-test and a post-test in elementary school. Turns out that even "back in the day" they were working toward specific learning targets. I sure wish they would have told me what the learning targets were...but that is another post. By comparing formative assessment results and summative assessment results, we can identify student learning trends and adjust our instruction in ways that address the real student learning problems. 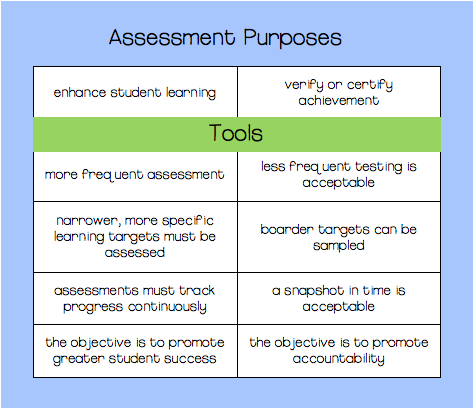 There are two purposes of assessment: enhancing student learning (ex. formative assessments) and verifying achievement (summative assessments). In my mind, this kind of eases some of the negativity. The tests that are being required by so many states are simply a snapshot in time that help us identify student learning trends. Based on those trends, we can do additional assessments to help us identify the student learning problems and adjust our instruction accordingly. If you look hard enough, you can find the good in anything. Assessment can be powerful and so can the way we use it to improve our instruction and student learning.